PURA - is investment into cryptocurrencies the future or a fantasy? The crypto world – future or fantasy? Hello PURA Lovers around the world! Happy hump day to you! All of you already active in the cryptocurrency market and those of you just starting out have experience that roller-coaster feeling. It is that feeling you get when you become involved in something you don’t know much about. As the cryptocurrency world is still in its beginnings, we want to shed some light on what to do. There are a few basics to consider before you think about starting in investing, and more specifically, in PURA. The cryptocurrency market is rapidly growing. The market is full of opportunities and equally awash with potential pitfalls. It is completely open to anyone with internet access. And it offers unprecented technological innovations and investment opportunities previously unknown. Blockchain technology was founded on the premises that no central institutions are involved. The market is hence unregulated. This fact may infuse uncertainty and hesitation. For the first time in the history of digitalization and finance, market participants are completely responsible themselves when participating in this novel realm. With almost daily media reports on stolen cryptocurrencies, possible regulation by national governments or political unions or hacked accounts, first-time investors may easily lose their cool and reconsider participation altogether. However, despite of their novel and highly volatile nature, cryptocurrencies, and blockchain technology as well, remain among the most promising innovations of the 21st century. We probably all agree that back in the days we went to school what we feared the most were tests and exams we didn’t prepare for adequately. All of us want to feel good and safe about starting an endeavor we have no experience with. The way to go about this is to educate ourselves on an ongoing basis. We want to prepare ourselves the best we can. Once we can make informed decisions, we are more at ease. We feel well informed and in charge of our decisions. The way we educate ourselves is the foundation of becoming responsible participants in the cryptocurrency market. The massive frenzy and hype involving investments in this highly volatile market is as enticing as in some instances dangerous. Some participants are literally going all in and making huge profits and losses over night. The fear of missing out (“fomo”) on a rush that seemingly offers endless financial opportunities overshadows the concept of getting involved in long-term sustainable investments. Investment in solid coins supports mass adoption, innovations for the common good and further development of the blockchain technology. For these reasons, PURA is working on becoming a valuable choice for sustainable, long-term investment. PURA protects our planet by being the world’s first socially and environmentally conscious cryptocurrency that is geared towards mass adoption. Protocol design in the next release coming up will contribute 10% of PURA mining rewards to the common good. These projects will fund fully transparent, blockchain-tracked, sustainable, environmental and social projects around the globe. In the long term, this decreases the need to simply trust a nonprofit or prosocial cause based on good faith alone. 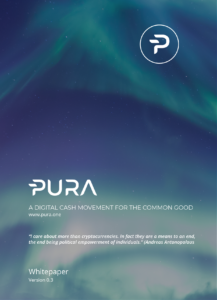 As opposed to the get-rich-quick-schemes underlying “pump and dump coins”, PURA is banking on steady development, state-of-the-art technology and the well-being of mankind in the long term. To stay in informed on all upcoming developments, like and share PURA on Facebook and Twitter and make sure you visit our website.